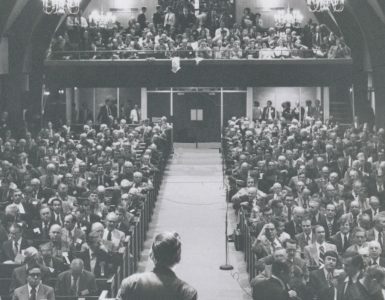 Believe it or not there was a day when major city newspapers reported at length on the proceedings of the church denominations when they convened for the meetings of their highest organizational gathering whether it was a convention, synod, or general assembly. In 1891, the Presbyterian Church in the United States of America (PCUSA) held its general assembly in the large and ornate Fort Street Presbyterian Church in Detroit beginning on May 21. The docket was full of substantial items of business along with the usual routine decisions needed each year to maintain the ministries of the highest judicatory. The moderator elected by acclamation was William Henry Green of Princeton Seminary who wielded a gavel made of Michigan wood, iron, copper, silver, and gold given to him by a representative of the assembly hosting committee. There would be plenty for Moderator Green to keep up with. The more extensive coverage of the meetings than usual by the New York Times could be attributed to the proceedings concerning the teaching of C. A. Briggs at Union Seminary in New York. The Fort Street Church was full to overflowing in anticipation of the Briggs case and at some points during the meetings police crowd control was needed. Constitutional issues that included the controversial subject of revising the Westminster Confession of Faith, a report from the Committee on a Consensus Creed for the Reformed Churches of the World, and a report regarding the tally of the presbyteries with respect to an overture on the subject of deaconesses added to the potential for heated discussion. Moderator Green was going to have his hands full and it was good that he had a new gavel. 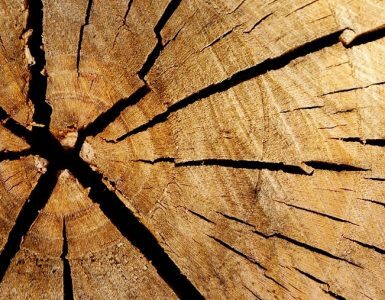 Along with the weighty and sticky-wicket issues for the commissioners to debate and decide were two tragedies that occurred during the days of meetings. On May 26 it was announced that a telegram had been received by the clerk with the news that recently elected systematics professor for Union Seminary, New York, Henry J. Van Dyke, D.D., “had died instantly last” night at home. Just a few weeks before his death Van Dyke had resigned from his ministerial call to the Second Presbyterian Church, Brooklyn, to accept the Union Seminary position. Then just two days later on May 28, Samuel Miller Breckinridge of St. Louis, after completing his twenty minutes of comments on the Briggs case, collapsed on the platform with his head making a resounding thud as it hit the floor. He was carried to a back room where he died shortly thereafter. Sixty-six year old Moderator Green must have been thoroughly exhausted by the twelve-day assembly when it adjourned on June 2. PRESBYTERIANS DECLINE IT AS AN EMBLEM. A DAY OF UNIMPORTANT WORK IN THE GENERAL ASSEMBLY—THE ONE QUESTION OF INTEREST CENTRES ABOUT DR. BRIGGS. Judge Shipman of New Jersey insisted that, if the symbol was to stand, it must be inscribed with the words, “This isn’t the devil.” The expiration of the time assigned to the subject brought it to a sudden end, but many Commissioners were so anxious to kill the snake that a great uproar was the result, caused by a torrent of motions and amendments rained down upon the Moderator till he actually lost sight of their proper order and put the motion which pleased him best, and which put the matter in a state of quietness, making it a special order for the afternoon. The business of the afternoon for the first hour and a half, despite the order of the day and the pressing business of the Assembly, was in continuation of the “snake business” of the morning, and after a long wrangle the snake was taken down and the report recommitted for corresponding correction. The Assembly seems to be getting tired of the postponement of its business from time to time. The report on the seal, for instance, has gone over [its debate time limit], now, four times. The origin of the snake wrapping the cross may have been drawn from the Bible’s account of Moses’ staff turning into a serpent before Pharaoh, and/or more likely, Moses lifting up of the brazen serpent in the wilderness. A cross smashing the head of a serpent would work better with Genesis 3:15 in mind, but how would such a scene be portrayed clearly on a seal? The only way the snake would work in the symbol would be if it represented Satan, which causes pause at the comment of Judge Shipman of New Jersey when he said that the words “This isn’t the devil” must be included. If the serpent is not “the devil” then what would the snake have represented? Was the report of the Times on the snake incident in the interest of giving its readers news about the church, or was it instead a cleverly written jab at the Presbyterians in particular and churches in general? Was the Times writer saying that such time consuming debate about an issue is an example of how frivolous Christians can be? Note the reporter’s subtitle of his Times article, “A Day of Unimportant Work in the General Assembly, The One Question of Interest Centres about Dr. Briggs.” For some New Yorkers and readers of the Times the issues of the Briggs case were the most important news coming from Detroit. The composition of a new seal was not abandoned but was instead committed to a new committee a week later when the assembly discarded the snake emblem as it had been presented and adopted the following resolution. RESOLVED, that it is the sense of this Assembly, that an open Bible be the central symbol of the Church’s seal, and that this Committee be instructed to prepare drawings which shall appropriately display the same, and report to the next Assembly. The committee reported the following year to the assembly meeting in Portland, Oregon. There was a copy of the image distributed to the commissioners. Included in the 1892 minutes was a lengthy verbal description on page 32. The terms “dexter” and “sinister” come from heraldry; the former means the right side, and the latter means the left side. In the image the “dexter” and “sinister” sides are reversed. The committee provided a detailed and complex description in the following text. In addition to this central emblem thus differenced, it is directed that a semicircular wreath of branches of palm in form as nearly as may be, like the decorative wreath upon the Westminster Assembly’s seal be placed upon the upper margin of the circular field, and in corresponding position below the Book, a wreath of olive and oak combined. 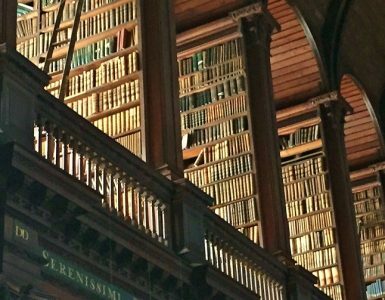 Further, that there be placed behind the Book and the wreath radiating rays of light filling the vacant spaces of the field. 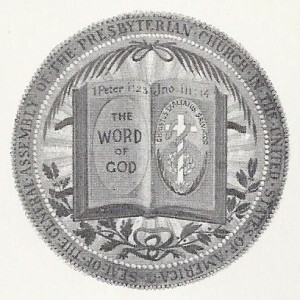 Surrounding the whole device the scroll of the seal shall bear the words, “Seal of the General Assembly of the Presbyterian Church in the United States of America.” As further indicating the will of the Assembly as above expressed, the Assembly refers to the accompanying drawing and engraving submitted by the Committee upon the seal. It surely required a gifted and patient person to interpret the lengthy verbal description, compose the crest, and fit it all into the emblem with clarity. The seal is pictured as it was included in the front of the 1892 assembly minutes. So, the wry reporter for the New York Times was wrong in the end, the snake was not discarded but instead included in the final version with its presence clarified by other design elements. Sources include the published Minutes of the General Assembly of the Presbyterian Church in the United States of America for 1891 and 1892. The resolution regarding the seal in 1891 is on page 134. As mentioned in the article, the verbal description of the seal is on page 32 of the 1892 minutes and the image shown in this article is as included in the front of the minutes. The New York Times was used as noted in the article but there are also reports available for other days of the assembly sessions in other issues of the newspaper.